Solution: One or more external, thick, SHORT CIRCUITED loops. But Attention: Do NOT make contact with the central screw or chassis. Best use isolated wire. Lack of free space within the chassis, so as to separate the two transformers: Mains and Output. I presented the concept of a welding machine, and finished of with a question of what has THAT in common with output transformers and hum in you loudspeakers. Well, actually, a lot. There is an old trick that I have seen being used in old tube amplifiers of sorts, especially those from the good old days. I tried the trick myself, using it on different types of present day transformers, and it works beautifully. a). A scattered magnetic field straying from the core of your transformer and wandering around the insides of you chassis – is BAD. In an ideal transformer, as a general rule, such stray fields are not accounted for. They simply should not be there. Their existence is a sign of imperfection, typical of a “real” transformer, as opposed to an “ideal” transformers (the latter do not exist). b). The scattered magnetic field is a residual, a fairly small percentage of whole field that is travelling through the core of your transformer. These small quantities somehow escape beyond the boundry of your core and circulate in the open air surrounding the transformer, in its vicinity. c). We know that a magnetic field that passes through the short circuit, made of thick copper (just as in a welding machine) passes over close to all of its energy into this short circuit, induces significant current flow through the short circuit and hence converts the energy of the magnetic field into heat, as the current heats up the wire in which it is flowing. d). When we do a short circuit on the secondary winding of a typical transformer – we shall quickly destroy it. Such a transformer, after less than two minutes after switch on, will melt (plastic casing) and / or catch fire, due to the immense amount of heat that is created from the short circuit. What if we make a short circuit on a magnetic field that “does not exist” ? In theory, nothing happens. No field. No induced current. Nothing changes. The idea is as follows: The SCATTERED magnetic field is something that should not be there in the first place. Assuming that it is of an insignificant strength, a value that is a small little percentage of the total magnetic field flowing inside the main core, we can safely SHORT IT !! Imagine a very thick, insulated copper wire, wrapped around the outside of the transformer, and shorted into a closed circle. If you posess a copper foil, or similar material – even better. We shall literally surround the scattered magnetic field with this short circuit, and force the stray and scattered magnetic field into non-existence, i.e. we shall force it to pass over it’s energy into the shorted circuit and to convert that energy into heat… small amounts of heat. We shall “takes away” the energy from the stray and scattered magnetic field, and convert it into another form of energy – heat – a form that does not hinder us in listening to our favorite music. So: We shall now intentionally create a short circuit on the transformer, BUT (ATTENTION!) a very specific one. DO NOT attempt to thread your “shorting” wire through ANY hole or opening or cavity within the core profile of your transformer. DO NOT attempt to thread your “shorting” wire through the central hole of your toroid. If you do that, you would in essence “encompass” the MAIN magnetic flux flowing in the core – and that would mean really BIG trouble, if you happen to make the short circuit complete. You have been warned. Ok, but we are considering not the main flux of magnetic field, but the stray one. 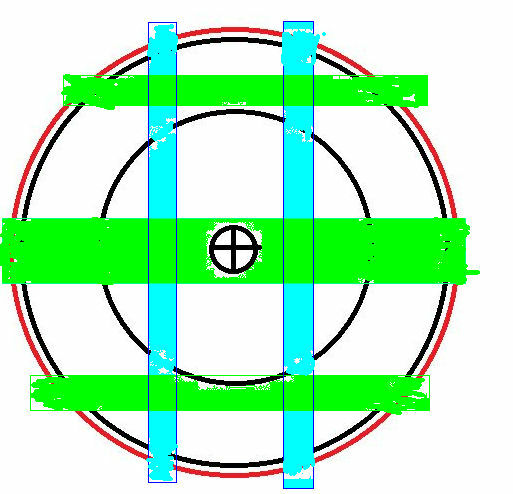 The stray field is the “sum” of the main field going one way, and then back again (with reversed direction). In theory, in an ideal transformer, the aforementioned “sum” of the two fields would be zero. But alas, the transformer has some stray field here and there, so the sum is not a perfect zero. The sum is actually the stray magnetic field that we wish to eliminate. 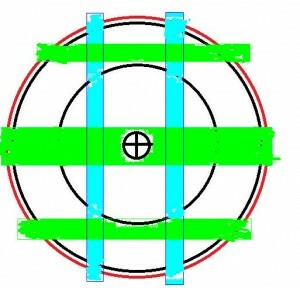 Make your short circuit in the form of a circle around the external parts of the magnetic core. Try to imagine the main field flowing one way, and then returning the other way, in a circular (as in toroid) or in a “figure 8” (as in E-I transformer profiles) fashion. Wrap your short circuit around the outsides of the transformer, so as to catch “both” directions of the fields running inside the transformer. Once again: to not thread through any holes! Simply surround the core from the outside with the short circuit. In this manner, “we force” the stray magnetic field into (almost) non-existence. For now the stray field will pass a major part of its energy to a thick wire that we used to make the short circuit and this will transform it’s energy into heat …. VOILA!! We just created a very quiet transformer ! Much closer to the “ideal” transformer. A Hiend-Audio transformer. Now, while we are observing and making sure that nothing is burning, lets contemplate a minute. The thing that we are doing here – is it safe ? Since we are making a short circuit on a field that “does not exist” … then (theoretically) nothing happens. But in fact, there IS a certain amount of energy in that field. Will the short circuit heat up my transformer to a level that I shoud be worried ? The answer is rather not. I have tried this trick on several transformers, both the good makes, as well as the lousy ones. In none of the cases have I observed any meaningful increase of temperature of the device. The temperature of the transformer remains in exactly the same as it was before “modification”. Hence, I allow myself to state, that the scattered field is only a tiny fraction of the main magnetic field, and the shorting of the STRAY field does not constitute a hazard.. When we add up a). and b). together, we shall obtain a fairly small resultant field passing through the coil that is shorted out along the outer boundaries of the transformer’s “outside”. We deprive the stray field of energy, converting it to heat, generated by the strong short circuit current flowing through the internal resistance of the short circuit. Put a short circuit loop around the cores, from the outside, aroud each of the two transformers, that seem to be magnetically coupled and are causing humming problems within you speakers. Use a thick copper wire, which is very well connected into a short circuit around each of them. Ensure that the short circuit is of the highest possible quality. It is better to use copper tape, but not everyone has it. Embrace each of the transformers from the “outside”, and be cautious not to thread through any holes within the transformers, or rather through any openings in the cores of the transformers. Close the short circuits. Ther should now be no hum. Or at least a significantly smaller amount of it. A compact external shorted coil significantly reduces the amount of interference spread by the transformer, but also acts vice versa : at the same time, it makes the transformer slightly more immune to interference coming in from the outside, entering the core of the transformer in the form of external, “foreign”, magnetic fields. Returning back to my friend who was building that DIY amplifier: we did a simple thing: two tight coils, one for each transformer, surrounding them from the outside. Made of the thickest wire that we were able to quickly buy in a home improvement stores. I think we used a 4mm2 grade solid core copper wire. The problem of hum was instantly resolved an disappeared. Perfect silence. NOTHING. No hum. Just the Music. It’s beautiful. Oh, and by the way, do not believe in those stories of metal cases that provide screeninf of the magnetic flux of a transformer. You cannot “shield” anything from the magnetic field. Even a 2mm thick solid steel plate is permeated by the flux of the magnetic field. The trick lies not in shielding, but in the conversion of energy. A note of caution. Again. Do not thread your wire through any holes that you find within the core. You shall get your final and satisfying result, doing everythin from the outside. If you have accidentally shorted your main magnetic flux, this will be easily recognizable. Transformer increases rapidly in temperature. Starts meltin in probably 1 to 5 minutes. It will produce a very loud hum, or an agonal moan, actually. The rise temperature will be evident, so do not burn your fingers while fiddling with it. A short test will not destroy your transformer, provided that it does not heat up to a point where everything is burning. It will not be a problem to notice that there is a problem, if there is a problem. You will notice it right away, that something is deeply wrong. You will actually hear it, how your transformer is slowly dying . When you hear it – immediately turn off the mains power, rip the cord from the wall. If it was fused, there is a chance that the fuse will trigger. I recommend just a little imagination, prudence and vigilance. That’s it. But I am perfectly confident, that you shall succeed. Oh, and by the way, does it make sense to apply such a modification to transformers that are feeding less crictical, non signal path circuits ? IMHO, Yes, it does. There will be less interference running around within the interior of your chassis. Cleaner power. Cleaner music. The trick is really worth the effort. Even if it is a less important ancillary transformer, feeding some logic circuits, or whatever. This transformer maybe indeed does not have anything to do with the components of the signal path. But that’s no reason spread stray fields around that chassis of yours. Toroids? Well, what about those ? Exactly the same thing. Likewise, you can make short circuit, encompass the toroid from the outside, with a shorted loop. To be sure, even a few independent loops. Of course, absolutely DO NOT thread through the central hole. Generally, toroids are rather low noise alternatives, in comparison to traditional EI transformers, but if we have the chance to make them even better, lets do it. By an order of magnitude better.